At The Garland we’ve implemented several programs that help make our hotel, restaurants and Earth a better place. So whether you’re staying or dining with us, rest assured we are doing everything we can to create a sustainable experience. We've recently partnered with PressReader which provides our guests with complimentary access to thousands of digital newspapers and magazines from around the world. We've recently partnered with PrintReleaf, a software platform that empowers businesses to sustain and grow our global forestry system. Through integration and software application, PrintReleaf accurately measures a customer's paper consumption then makes it actionable. Customers have the opportunity to select where to reforest their consumption through a network of global reforestation projects. We are certified TripAdvisor GreenLeaders – Silver Level. Every Earth Day, we host a clothing drive where we donate all proceeds to San Fernando Valley Rescue Mission. Our landscaping features drought resistant and native region flora. The hotel lighting is 90% LED which conserves up to 20% more energy than traditional florescent lighting. 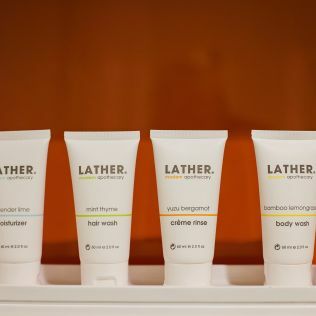 Our in-room toiletries, LATHER, are locally produced, use sustainable practices and are 100% biodegradable. We incorporate organic and fair trade food and beverage whenever possible. We have an on-site vegetable and herb garden, where we harvest cilantro, radishes, lettuce and other greens to be in used in our culinary dishes. If we have extra harvest, the food items are donated to local charities. To conserve water consumption at The Front Yard, water is provided to guests upon request. And that’s just a small sampling of the green initiatives at The Garland. We are continuously doing our part to make Earth a better place for generations to come.